The word affirm means to ‘state something that is true’. Affirmation cards have simple but positive messages that help to develop a child’s sense of self. When used regularly it is hoped that the children will absorb the positive message and become more positive in their outlook in life. They will really begin to believe the statement that they are working on. The message needs to be realistic and very simple. Having unrealistic affirmations may make a child feel worse about themselves and your aim with these is to increase their self-esteem. All these cards begin with the words ‘I am’ and are very simple but achievable statements for all children. Thank you to the members of the ELSA Group for helping with some of these ideas. Lay out the cards and together choose one card to work on, to begin with. You could make a personalised box to put the cards in. This could be decorated with a photo of the child or you could put in a little mirror. Each day, preferably in the morning the child should look in their mirror and repeat the affirmation 5 times out loud. If the child is comfortable with this encourage them to share their affirmation with others such as parents, teachers, and good friends. This should be repeated daily for a week or two. Then choose another card to add to it and so on. Lay out the cards and ask the child if they can think of a time when they have shown this quality. Can they tell you about it? Ask the child if they can think of a time when someone else has shown this quality. Can they tell you about it. Lay out the cards and ask the child to pick THEIR top five qualities. Can they order them from the one they most relate to and the one they least relate to. Choose an affirmation of the week for your group or your whole class. One of the larger copies could be displayed in the classroom or group area. Children could explore this quality in more depth to really understand what it means. For example, ‘I am kind’. You could create a kindness jar, and children could look out for acts of kindness. You could have a ‘I caught you being kind’ certificate to give children. Have a set of cards in the centre of the circle. Use either the full page ones or the half page ones. Children take turns to pick a card and then give their card to someone in the circle who they believe shows this quality. This is a great way of giving compliments. So many children believe a compliment means complimenting another’s appearance rather than their inner qualities. Ask a child to volunteer to sit in the middle of the circle and the other children must choose 5 qualities that represent that child. 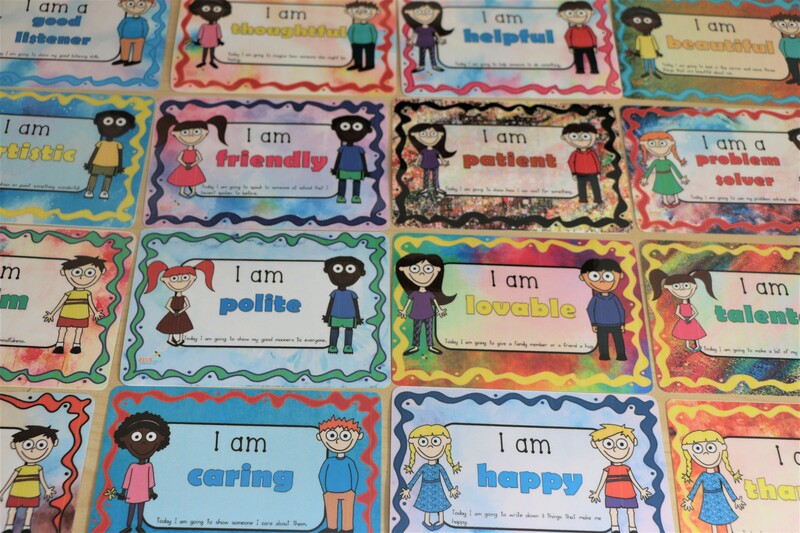 Give each child a whiteboard and pen and read through the affirmations together. Ask them to write down 5 that represent them on their whiteboards. Ask the child to pick a card and then draw what this quality looks like to them. If using the ‘superhero’ cards then what would a ‘kind superhero’ look like? What super powers would they have? If using the ‘child’ cards then what would a ‘kind child’ look like? What kind things might they do? Hide the cards in sand, rice, or anything else that would add a sensory element. Can they choose one that represents them? Ask the child to choose one affirmation that they do not believe they are or have. They do aspire however, to have this quality. It might be something such as ‘artistic’. How could they achieve this quality so they do believe. Make a plan together. Ask the child to pick a card. How can they use this quality today or this week? Ask the child to make a list of their friends and then put an affirmation card next to each person that best represents them. Ask the child to make a list of their family members and put an affirmation card next to each person that best represents them. Ask the child to think of a problem that they have encountered. Which quality would best help them if they were in this situation? Ask the child to draw a comic strip of them showing one of these qualities. There is a whole pack of comic strips here. Lay out the affirmations to look like a board game. Throw a die, move a counter that number of cards and whichever one they land on they must think of a time when they demonstrated that quality. Give the child a puppet and choose an affirmation for the puppet. What might the puppet say or do if they are showing this quality? As a group pick an affirmation card. The children must act out this affirmation together. When looking through a book together, have your affirmations to hand. Ask children to put different qualities to the different characters in the book. Lay out the cards and ask children to choose their top five. Give the child 5 pebbles to decorate using the qualities from those cards. They can make their own little rock garden. Use a template of a shield and split into 4. Ask the child to choose 4 cards that represent them. These qualities will protect them from so many things. They can write the word in each section and illustrate it. Make a booklet of affirmations for the child. Each session choose an affirmation to stick in their book – just print the cards onto paper for this. Next to the affirmation they can draw a picture or write a few sentences of how they show this quality. These affirmation cards have a small task to do at the bottom of the card. Can the child achieve this task or can they think of another task they could do to demonstrate this quality? Sort out the cards into three piles. ‘Yes they do believe they have this quality’, ‘No they do not believe they have this quality’ and ‘Maybe they have this quality’. Then talk about how they can achieve the ones on the ‘Maybe pile’ and then on the ‘No pile’. Lay out the cards and ask the child to choose a family member or a good friend. How do they think that person sees them. Get them to pick out the cards. Lay out the affirmation cards and ask the child to choose 5 cards that represent them. Ask them to draw around their hand and write an affirmation on each finger. In their palm they could draw a picture of themselves. Ask the child to choose 3 cards that represent them and one card that shows something that they wish for. When working one to one, you choose 3 cards that you think represent the child and then they choose 3 affirmations that they think represents you. If you would like to purchase the cards on the website then here are the links. Please click the pictures to take you there.